Someone once said to me (in a bingo lobby funnily enough) that bingo was 99% luck and 1% skill. And that made perfect sense actually since when it comes to playing and winning at bingo, your chances are based on luck more than they are skills. Because bingo is, at its very core, a game of chance. A game that is played with numbers that are randomly drawn. So there’s virtually no skill required to win at bingo, it’s just down to chance and luck in having the numbers that come out. And winning at bingo shouldn’t be the main reason you play it. Although for a lot of people it is! But bingo is a game that should be enjoyed playing alongside other people. Whether it’s in your local bingo hall or at an online bingo site. However, while bingo might be purely a game of chance and luck, it doesn’t mean to say that you can’t improve your chances of winning with the right bingo strategy! To help with that, here’s my top five bingo winning strategies. 1 1. Play Much – Play Often! 5 5. Don’t Play Too Many Cards! 1. Play Much – Play Often! Like any game, you have to be in to win, such as the lottery, the more times you play it, the more chances you have of winning. That much sounds obvious, but some people have invested heavily into researching bingo strategies and even come up with complicated mathematical equations on it. But none of it improved their chances of winning as much as playing much and playing often have done. That said, staying in the game for as long as you can also improve your winning chances! Playing when attendance is lower than usual increases your chances of winning. You will need to buy as many bingo cards as you can afford for that session of course. That might mean buying the cheaper level 1 cards. And you will win less that way. But you will also win more often as well. You can help that by purchasing the bonus ball or whatever it’s called at the bingo hall or site you’re playing in or on. Some bingo halls and sites let you buy an add-on as well for all your purchased cards. However, if you’re someone that doesn’t like playing with too many cards (it can get confusing). Then you should play in a session that only has one play level. That way, all of the players in that session all get the same amount of cards. That will increase your chances of winning even more since you’re not playing against too many single pay bingo cards. When a progressive jackpot has grown large, someone is more likely to win it. That’s simply because the bingo hall or bingo site hasn’t earned enough in lost bets (card purchases) to merit letting someone win the jackpot. Have you ever noticed that when a jackpot is high, so is some people playing for it? This is when you should always play since someone has to win that jackpot so why not you? There might be more money spent on these games, and the competition is high, but you have got to be in it to win it just the same! If you want the best experience and be in with a winning chance when playing bingo then one of the best strategies to do is to read bingo site reviews. There are millions of bingo sites out there, as well as many real bingo halls. But not all of them are equal! Not regarding the overall experience they provide and how many people win. Some bingo sites don’t have as many winners as other do. This could be down to some people that play them, but by doing some research first, by reading bingo site or bingo hall reviews, you’ll be better equipped at knowing which one is best to play in or on. 5. Don’t Play Too Many Cards! It can be very tempting to buy many cards hoping that the more you buy, the more chances you have of winning. But truth be told, playing too many cards can become overwhelming and confusing if you’re not too savvy a person. The idea and general rule of thumb is to play a good game with only a few cards instead of playing too many cards and ruining your game. Remember – bingo is a game that should be a fun experience to play regardless to if you win or not! Play with too many cards, and you’ll quickly lose track and possibly even lose out on a win. Winning at bingo isn’t science that can be worked out and won with some mathematical equation! 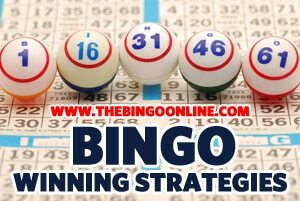 Bingo is meant to be a fun and enjoyable game to play where the winner is the lucky one. But follow these strategies, and you will improve your chances of being that one lucky winner and get to shout out BINGO!